Have fun when you exercise your Kegel muscles with the luxurious Ami Pelvic Floor Exercisers. Kegel balls are weighted vaginal exercisers that cause the pelvic floor muscles to contract and relax naturally as the weights inside move around. It’s a brilliant way of targeting the pelvic floor muscles and an excellent addition to your usual kegel exercise routine. Evidence suggests that using kegel balls whilst contracting and relaxing the pelvic floor is the most effective form of treatment as it is resistance exercise. Just like lifting weights at the gym, our muscles work harder and become stronger when they have something to work against. Je Joue is a leading British manufacture which specialises in combining beauty and pleasure in their range of adult toys. Here they offer their Ami Kegel balls, designed not only to tighten your pelvic floor muscles but to give you a good time as you exercise. Ami look and feel sensual in a gorgeous deep plum colour and covered in silky-soft body-friendly silicone. The Ami set has three trainers in graduating weights and sizes to allow you to gradually build up your muscle strength. Ami 1 is a large, soft and lightweight single ball, suitable for those who are brand new to kegel exercising and have little muscle strength. Ami 2 is a medium-sized double ball, slightly heavier but still soft. Ami 3 is a small, hard and heavy double ball, designed for the most advanced users who have built up good muscle tone. When the balls are worn, weights inside them naturally move around which causes the pelvic floor muscles to contract and also gives pleasant sensations. With regular use your pelvic muscles will become stronger and you’ll enjoy increased sexual sensation, so not only will you have fun training your muscles with Ami, you’ll enjoy the long-term effects in the bedroom too. 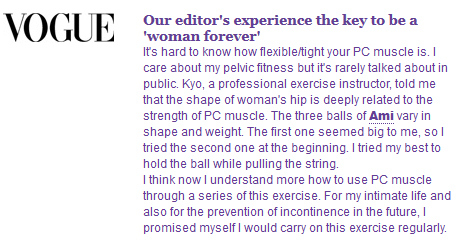 Of course there’s also the benefit of increased bladder control as the pelvic floor muscles become more toned. If you suffer from stress or urge incontinence the Ami exercisers will have brilliant results with some women reporting that after just a week they began to see their incontinence reduced. As with any other kind of exercise, it’s important to keep it up even after reaching the level of fitness that you want. We recommend that you exercise every day if possible, but once you have worked your way up to Ami 3 and feel confident that you have complete control you should continue to exercise once or twice a week to keep your muscles in tip top condition. The smooth, round shape and texture of the Ami set means they are very comfortable to insert with a little water-based lubricant and easy to clean with warm soapy water.